I first met Billy over two years ago when he attended my PAMIS music group sessions at Templehall in Kirkcaldy. Very quickly I discovered Billy’s interest and enthusiasm for music. He immediately engaged in the sessions and showed an eagerness to play an assortment of instruments. Billy returned for a further two blocks of sessions, the latter working on a one to one basis. This proved to be a huge turning point for Billy as he was starting to become aware of his achievements. In music sessions I tend to use a music notation system called ‘Figurenotes’. 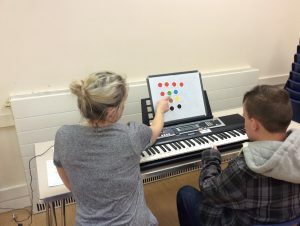 This system originates from Finland and was originally designed for people on the Autistic spectrum to help them learn to play music using colour and shape. I introduced Billy to Figurenotes very early on in the group sessions, and we would use colours to play chime bars and to conduct the group. Billy showed excellent colour recognition, allowing him to progress quickly in stage one of ‘Figurenotes’. Billy started by writing his own short melodies using ‘Figurenotes’ shapes and colours, and quickly progressed to learning popular songs using ‘Figurenotes’ notation. From the first session in this block it was evident that Billy enjoyed playing the keyboard and ultimately this became his instrument of choice. Billy has since learned an eclectic mix of songs that he can play on the keyboard, from Elton John to Bach to Robbie Williams. Billy tends to play the main melody while I accompany him either on the guitar or the bass part of the piano. Reflecting on these sessions, I remember vividly the sense of achievement Billy showed. He spontaneously laughed or giggled half way through a song in recognition of what he was playing, or he would turn and smile at me once he had finished playing. His family and carers have been very supportive of his music sessions, which I feel has helped Billy understand the progress he has made. Since Billy started playing the keyboard and using ‘Figurenotes’, his family and I have noticed positive developments in his concentration skills, communication, listening skills, co-ordination and confidence. 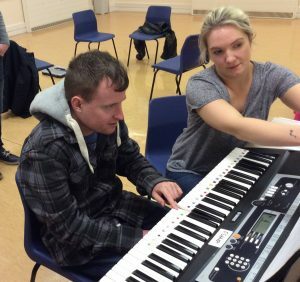 The Cultural and Leisure worker for PAMIS, Andrew Smart who sat in on the majority of music sessions with Billy said: Billy has worked hard and has really developed his skills; he also shows great concentration and enthusiasm while playing the keyboard. Well done Billy! I continue to see Billy on a weekly basis in his home and he now has his own keyboard which he uses to play a wide selection of music. Without the help and support of PAMIS, Billy and I would probably never have met and Billy’s enjoyment of music and obvious talent for the keyboard may never have been established.